The Sarvāstivāda School ostensibly forms part of the background against which the Prajñāpāramitā literature developed. Indeed many see the early Prajñāpāramitā texts as taking the time to refute certain Sarvāstivādin ideas. Nāgārjuna appears to be in a conversation with Sarvāstivādins. This suggestion of a conflict between Prajñāpāramitā and Sarvāstivāda is an important one for understanding the Prajñāpāramitāhṛdaya. This is because, despite the received tradition about when it was composed, and despite various late sectarian commentaries, the Hṛdaya is largely made up of chunks of texts from the Pañcaviṃśatisāhasrikā Prajñāpāramitā Sūtra and thus has more in common with the outlook of early rather than late Prajñāpāramitā thought. The Sarvāstivādins are also intrinsically interesting in that they seem to have been the dominant Buddhist school in India for a considerable length of time. There seem to be two main reasons we know less about them than we do about the Theravādins. Firstly their texts mainly only survive in Chinese translation and until relatively recently Westerners have not been very interested in these texts (possibly influenced by the linguistic demands of having to know at least Sanskrit, Pali and Classical Chinese in order to study the literature); or in fact interested only where Sanskrit "originals" are known to exist (Cf. Which Mahāyāna Texts?). Secondly, the focus has long been on Theravāda as representative of early Buddhism. But if any Buddhist school "represents" early Indian Buddhism it is the Sarvāstivāda. A third reason we might not think of them as representative is that early Buddhist was eventually eclipsed first by Mahāyāna Buddhism (though very often on the basis of the Sarvāstivādin Vinaya) and then Tantrism. So that even where monks follow a rule based on the (Mūla)Sarvāstivāda Vinaya and study Abhidharma through commentaries on the Sarvāstivāda Abhidharma (cf. Nietupski 2009), they don't identify themselves as Sarvāstivādins. As encapsulated in the name 'Sarvāstivādin,' the Sarvāstivādins are characterized as maintaining that "everything exists" (sarvam asti). However, the simplicity of this ontological assertion contains the seeds of doctrinal divergence because the referent of the term 'everything' and the manner in which this "everything" is considered to "exist" must be specified. Certain early Abhidharma texts identify the term 'everything' in the declaration that "everything exists" as referring to the twelve sense spheres including the six sense organs and their corresponding object-fields. So also the *Mahāvibhāṣā, in a discussion of the twelve sense spheres, cites a sūtra passage in which the term everything' is defined by the Buddha as "precisely the twelve sense spheres from the form sense sphere (rūpāyatana) up to and including the factor sense sphere (dharmāyatana). I want to make a short digression to point out that Buddhists very often use the word asti not as a verb (3rd person singular indicative) 'it exists' but as an action noun meaning 'existing, being'. Thus we don't need to syntactically derive sarvāsti in Sarvāstivāda from the sentence sarvam asti 'it all exists', with an awkward silence over why sarvam loses it's case ending; but can treat the word as a karmadhāraya compound sarva-asti 'everything existing'. The sūtra passage referred to in the Mahāvibhāṣā (Cox's asterisk means the Sanskrit title is reconstructed from Chinese) probably corresponds to the Pāli Sabba Sutta (SN 35.23). This sutta has a Chinese parallel from one of the two Saṃyuktāgama translations (T 99 #319, 91a24-b03) this one being attributed to the Mūlasarvāstivāda School. "T 99 is widely considered to have been translated in the period 435-443 CE from a Sanskrit Saṃyuktāgama brought to China from Sri Lanka." (Bucknell 2011). Since I see this as a seminal text, and as it seems directly related to the Sarvāstivāda School, I will present my rough translation of the Taisho Tripiṭaka version. *Sarva Sūtra (Title not given in Chinese). Thus have I heard, one time, the Buddha was staying in Śravāsti (舍衛國) in the Jeta Grove of Anathapindada. Then, Jānussoṇī, the brahmin, approached the Buddha, exchanged greetings, and retreated to one side. He said to the Buddha, "Gautama, 'all' (一切 yīqiè = Skt. sarvaṃ) is said, what is 'all'?" The buddha answered the Brahmin, "'All' is namely the 12 āyatanas: eye & form (colour), ear & sound, nose & smell, tongue & taste, body & touch, mind & dharmas. This is called 'all'. Even if the words were said 'this is not all', Śrāmana Gauatama says this is 'all'. I will explain the rejection. A different 'all' does not stand. He who speaks this. Asked, does not know. His doubts increase. So who and where? Because this is not the proper domain (Skt. viṣaya 境界 jìngjiè )." Then, Jānussoṇī. the brahmin having heard the Buddha was delighted and rejoiced. At Sāvatthi: I will teach you the whole, monks. Listen to this. What, monks, is the whole? The eye and forms, the ear and sounds, the nose and smells, the tongue and tastes, the body and touches, the mind and mental phenomena: this, monks, is called ‘the whole’. If anyone says ‘I reject this whole, I will declare another whole’ that would just be hot air. Questioned about it, they wouldn't be able to explain, and would become exasperated. Why is this? Because that, monks, is in the wrong location (avisaya). At first there was only Brahman, and it only knew itself "I am Brahman". From that it became everything (sarvam). So, sarvam means 'the created world'. Sometimes the idiom is idam sarvam meaning "this whole [world]". For the Ṛgveda it seems to mean Creation in a fairly literal sense. In BU sarvam begins to take on a more mystical sense, it is the manifest aspect of Brahman. And it is through identifying oneself with the world, i.e. with Brahman, that one attains (re)union with Brahman. And this may be why Buddhists called the meditation in which one identifies with all the beings in the world, brahmavihāra 'the dwelling of Brahmā (or Brahman)'. The Sarva Sūtra almost certainly reacting to the Vedic usage, sets all this aside. The whole from this point of view is the six senses and their objects. In another Pāḷi text, the Dvayam Sutta (SN 35.92) this same formula is referred to as "the pair" (dvayam). But it is not the objects or the senses per se that concern the sutta. The alternate term dvayam reminds us that the two together form the basis for the arising of sense-consciousness. The beginning and end of the interest of the text is the sense objects and sense organs. All experience begins with these, there is no other source of experience. It is through observing experience that we are liberated. Any speculation which lies outside of these, particularly any metaphysical speculation about the nature of the objects of the senses, is out of bounds (avisaya). Cox (1995: 134 ff.) goes on to outline some of the arguments between Saṅghabhadra and Vasubandhu about the interpretation of this sūtra and the implications each drew from it. The story is far from simple. "The very sutra passage that defines the term 'everything' as the twelve sense spheres is cited by both Vasubandhu and Saṅghabhadra as scriptural justification for their divergent ontological positions." (1995: 134). But one thing that the text does not say, in either Pāḷi or Chinese, is that the āyatanas "exist". They represent the whole of the Buddhist's field of interest and, citing the Kaccānagotta Sutta, we believe the early Buddhists were not interested in the issue of whether or not they exist. However since the phrase imasmin sati idam hoti "this existing, that exists" is so central to Buddhist we must allow that the sense object and sense organ cannot be non-existent if they are to act as conditions for the arising of viññāna and phassa etc. And this leads into a discussion about how the Sarvāstivāda got its name and its eponymous doctrine which will be covered in a forthcoming essay. Bastow, David. (1995) 'The First Argument for Sarvāstivāda.' Asian Philosophy. 5(2): 109-125. txt online. Bucknell, Roderick S. (2011) 'The historical relationship between the two Chinese Saṃyuktāgama translations.' Chung-Hwa Buddhist Journal. 24: 35-70. pdf. Cox, Collett. (1995) Disputed Dharmas Early Buddhist Theories on Existence: An Annotated Translation of the Section on Factors Dissociated from Thought from Sanghabhadra's Nyāyānusāra. Tokyo The International Institute for Buddhist Studies. pdf. Nietupski, Paul K. (2009) 'Guṇaprabha’s Vinayasūtra Corpus: Texts and Contexts.' JIATS, no. 5 (December 2009), 19 pp. One of the things that most strikes me about discussions with Buddhists is how seldom they seem to think like Buddhists. All too often Buddhists merely unthinkingly assert Buddhist doctrines and do so in a way that seems to me to contradict the very doctrines that are being asserted. Buddhists very often seem to be deeply resistant to the consequences of "everything changes" to the point where the history of Buddhist ideas is largely hidden from most modern Buddhists. And nominal Buddhists seem to unconsciously think in modernist terms: one begins to see why David McMahan called his book Buddhist Modernism and not Modernist Buddhism! In my last essay (Pulling Wings Off Fairies) I outlined some contrasts between objective and subjective as understood in our cultural milieu. However had I been arguing from a purely Buddhist point of view I would not have used the terms objective and subjective at all. So what would it look like to think like a Buddhist in relation to a current issue in discussions with Buddhists? One of the lively issues for Buddhists in the modern world is rebirth. With Scientific rationalism beginning to bite, apologetics for karma & rebirth are becoming common, e.g. Thanissaro, Śākya Indrajala, Bodhi, Sangharakshita, and Vessantara's resent essays Some Problems with Not Believing in Rebirth & More on Rebirth. On one side we have Buddhists saying that belief in karma & rebirth are essential to being a Buddhist. On this view karma & rebirth "make sense". On the second side we have the mostly hidden history of Buddhists struggling to make sense of the received tradition and constantly altering doctrines or inventing new ones. The received tradition has in fact never made complete sense to Buddhists. And on the third side we have scientific discoveries that make any kind of afterlife seem deeply implausible; and stories about a "moral universe" seem like wish-fulfilment fantasies. For the most part we approach this problem on its own terms. We try to decide what constitutes evidence; assess which evidence is salient to the problem; weigh up the salient evidence and make a decision about what seems most plausible; and call that "truth". That act of deciding what is true is belief. Each stage of this process is complex. Indeed each stage is a decision making process in itself. So getting to a clearly enunciated belief involves a series of interrelated decisions. Almost none of this complex process is conscious. Even our most deliberate conclusions rest on a vast raft of unconscious assumptions. On the whole the way we approach this problem is the way that we approach any problem: it is a mix of standard human problem solving strategies; specific tactics associated with the culture we grew up in; and a veneer of Buddhist training. Discussions about karma & rebirth are particularly polarised. Belief plays a central role in our approach to Buddhist soteriology (contrary to our own narratives about the absence of 'blind faith' in Buddhism). Some argue that not believing in karma & rebirth has weighty consequences - it renders our soteriology meaningless. If we are not reborn then what is the point of Buddhism which aims to free us from the rounds of rebirth? If we just die and that's it, then buddhahood which takes so very many lifetimes to achieve becomes unattainable. For many Buddhists the belief in a moral universe, a fair world, is an article of faith. But the world, life, is demonstrably unfair: bad things happen to good people; bad actions regularly go unpunished. The solution, almost universally adopted in human cultures, is to have a post-mortem reckoning. Life clearly is not fair, but the afterlife is fair. Thus in denying an afterlife many people, many Buddhists, feel we are condemning them to an unfair world, and unfair life. And this thought is intolerable. It does not make sense to anyone who believes that the universe ought to be fair. For many traditionalists the issue is so profound that they insist that denying karma & rebirth means that one cannot be a Buddhist. And for a zealous Buddhist, not being a Buddhist is a terrible thing. To exclude a fellow Buddhist from the fraternity of Buddhism is about as violent as Buddhists usually get. "You are not one of us" is about as horrible a fate as most Western Buddhists can imagine. Some colleagues have made sustained attacks against what they variously call materialism, physicalism and scientism. Such views, they argue, go beyond what is knowable. To many people the idea that by studying matter we can learn about the subjectivity of consciousness is anathema. Like Indrajala many are explicitly ontological dualists. Nothing we learn about matter can inform us on the subject of spirit (See Metaphors and Materialism). In this argument karma & rebirth get tucked under the umbrella of subjectivism and are thus freed from the restraints placed on them by materialism. Nothing need be measured, because the subjective cannot be measured. They frame the discussion about karma & rebirth as a polar choice between fideism and scientism and make it clear that scientism is entirely counter to the values of Buddhism as they understand it (again "you are not one of us"). More recently I have become interested in the history of the ideas of karma & rebirth. I'm working on a paper which proposes a partial history of karma. In an article for the Triratna Order I outlined eight problems with rebirth: Some Problems With Believing in Rebirth.pdf. I pay particular attention to the fact that, as far as we know, no Buddhist sect took the tradition on its own terms. Not even the Theravādins accepted the Pāḷi sutta version of karma & rebirth on face value. The history of these ideas is largely hidden, in part for the same of simplicity I suppose, but I begin to wonder if we Buddhists actively suppress our history where it might undermine our certainly. I've already mentioned some of the problems with karma & rebirth in my blogs about them: e.g. the disconnect between ethics and metaphysics (see also Does Karma Break the Rules?). I've been arguing for the implausibility of any afterlife for a few years now. Across a number of essays on this blog I have spelled out the kind of evidence that carries weight for me. I've also tried to show why some of the other evidence ought not to carry weight. I've tried to show why we should not take the Pāḷi canon literally for example, why testimony cannot always be trusted, and why subjectivism is a philosophical dead end. That said, I'm happy to acknowledge that rejecting karma & rebirth has major consequences for Buddhism, and that a lot of thought will have to go into understanding whether the resulting worldview can even be considered Buddhist. I'd like to participate in that discussion, which I find more interesting than apologetics or blind faith in tradition. But none of this is thinking like a Buddhist. Indeed most of the time I'm writing more as an historian of ideas, with a background in the sciences, than as a Buddhist. If we really wanted to get down to it, what would a Buddhist approach to this question be like? What, in short, would the Buddha make of this? What follows is my attempt to put aside modernism and analyse the problem from the point of view that I think pervades the early Buddhist texts, but which is picked up on by Prajñāpāramitā literature and to some extent by Nāgārjuna. First off I would argue that the content of this debate is largely irrelevant if we're thinking like Buddhists. Whether we believe in rebirth or don't believe in rebirth is not that important. I'll qualify this a little. The content of our beliefs are not important so long as they do not get in the way of the kind of inquiry I'm about to outline. What is belief? Or better, how do we know that we hold a belief about a subject. Say someone asks us "What do you believe about karma & rebirth?" Leaving aside the content of the belief, how do we even know that we have a belief? What is the phenomenology that accompanies the generic statement "I believe..."? Broadly speaking we know what we believe because on introspection there is a combination of thoughts and emotions. And these occur along with a special kind of thoughts that we call "memories"; specifically memories of similar moments of introspection, either on this question or related questions. A belief is a combination of thoughts and emotions, linked through time by memories. Various different states are possible. Various kinds of thoughts, with various content. Various combinations and strengths of emotions. Various memories. And the sum of this is how we know what we believe and how strongly we feel about that belief. This is what belief boils down to: some thoughts and emotions and memories. And what is really important about these thoughts and emotions and memories is not the specifics of their content; not that we have this thought and not that thought; this emotion and not that emotion. If we take any one aspect of this complex of what would traditionally be called cittas or dharmas we notice that it has certain characteristics in common with all the other aspects. The main thing is that it doesn't last very long. One second we're feeling certain about karma & rebirth, the next we're noticing something about the person asking the question, then scanning the environment, back to our interlocutor, check in on the belief, formulate a verbal response, evaluate the mental state of the other through facial expression and posture, scan the environment, notice the time, re-confirm the feelings associated with the belief... and so on. Each moment of cognition lasting a short time, and each being held in a way that can be framed as whole or at least a gestalt, in which "we" are self-aware and communicating with another being who seems to be self-aware in the same way as us; all discreet moments but seemingly continuous through time. This whole or gestalt is "the world" or loka we inhabit. It is our world (though not the world). For the most part the details are lost and we take the whole to be real. And we experience it all from a first person perspective. Though all worlds overlap to a greater or lesser extent. Thinking like a Buddhist entails deconstructing this gestalt. It involves cultivating disbelief. Getting lost in a film or dramatic performance involves the suspension of disbelief so that we can get caught up in the show and experience it as though it is real. Buddhists argue that we are caught up in the show of our loka and this makes us unhappy because our expectations are not in line with the nature of the loka qua performance. So we must try to regain our sense of disbelief in the gestalt. Many Buddhist texts involve deconstructing the first person perspective. They do this in a way that is tuned to the times they were composed in (mostly Iron Age India). We might do it a little differently these days. But breaking down this whirlwind of sensations is what we're trying to do. In order to do this Buddhists have proposed a method. Indeed we might say that thinking like a Buddhist is less important than acting like one. The first part of the method involves calming down. By restraining our sensory input, restricting what comes in through the gates of the senses, we reduce (in modern parlance) our level of arousal. Moderns are mostly massively over-stimulated. We need to get the hindrances to samādhi under control and (as a direct result) develop a sense of joy or well being (pāmojja). Then we use specific practices to do two things: firstly to enhance that sense of well being and our sense of being interconnected with everyone (the two are virtually synonymous); and secondly to focus on smaller and smaller aspects of experience and by doing so bring on, by stages, a deeply serene absorption or samādhi - a word which more literally means 'integration'. It is from the point of samādhi that the examination of the nature of experience can begin in earnest - the attempt to "see through" (vi-passana) the play of experience. In this sense thinking like a Buddhist means setting up the conditions to reflect deeply on the matter in hand: not the content of thoughts but on the process of having thoughts; not on the emotion that is moving us around at any given moment, but on the process of having an emotion. Reflection is not something to be done at random or while still caught up in the tsunami of sensations washing over us. If we don't make an attempt to get to higher ground, we'll just be caught up in the wash. This is why renunciation has usually been valued in Buddhism. Of course many variations on this procedure exist after more than twenty centuries of thinking about experience this way - Buddhism has a hidden history of development, innovation and diversification. Only a few of the methods that have been tried remain popular, and new approaches are being invented all the time. The common thread is the focus on seeing experience itself for what it is; though all too often we phrase this in terms of trying to understand the nature of reality (something the Buddha didn't do to the best of my knowledge). That said some Buddhists apparently disagree with this. Dharmavidya has recently argued, along the lines Shinran, for example, that effort makes no difference and that all that is required for liberation is faith. It's much harder to see this as part of the mainstream Buddhist project. It would appear to be a kind of belief that gets in the way of making an effort to examine experience in a way that unlocks it. It appears to require the kind of intervention that is specifically defined as impossible by early Buddhist texts (which was the point of my article about King Ajātasatthu). Some Tantrikas also disagree with this kind of view, though renunciation is still included in some form in Tantric practice - there is always a perfunctory stage of renunciation in Tantric sadhānas for example. Having attained bodhicitta one need not bother about ordinary human responses and can get on with antinomian practices. In this view, if we believe in karma & rebirth and all that that entails, or if we do not, it does not change the task facing us. We still have to stand aside from the experience and analyse it. Even if we don't experience belief as impermanent, or especially when we don't, we need to make a effort to see that it is. In this sense having some doctrinal axioms like "all experiences are impermanent" is useful. We might introspect and find that our belief seems extraordinarily strong. We cannot imagine not believing in karma & rebirth. It totally makes sense to us on every level that we can think of to examine. But the belief itself is still just an experience. It's so easy to get caught up in the strength of the belief and the implications of that, but the acute observer will note the arising of that feeling and its passing. Experience is always coming into existence (or awareness) and always passing out again. Moment to moment. In relation to this the content of the experience -- the pleasant/unpleasant -- is a minor consideration. Just as waves don't make any difference to the salty taste of the ocean. No doubt there are waves and they are important in their own way, if the subject is coastal erosion for example. But in the Buddhist view what's important is seeing through the fascination with our world and seeing it for what it is. One cannot effectively do this while caught up in strong beliefs about how the world is. And if I don't believe in karma & rebirth but believe in something else, then that too is just an experience. It does not change the task. It does not change the approach to the task. All it changes is how we conceptualise the ultimate outcome of the task. And for the most part the task is still the same: one is still trying to cultivate disbelief in the framework which makes belief seem to plausible. How important is the particular conceptualisation of the ultimate outcome of Buddhism? Does it matter that if we deny repeated deaths that the word "deathless" ceases to have any meaning? People who believe in rebirth see life as extending over a much longer period than people who don't. When Kūkai arrived back in Japan from China in 806, his slogan "awakening in this very life!" confused the hell out of almost everyone, because they believed that awakening took three incalculable lifetimes. The time scale might be a significant aspect of belief. If our goal is life times away in the future and we're chipping away at a mountain by rubbing it once with a silk clothe once a century (a metaphor for awakening drawn from the Mahāyāna) then we won't be in a hurry. There's no call for a sense of urgency. If we are already 40 and can expect 30 to 40 more years of life at best, then the sense of urgency might amount to a counter-productive panic. If we think we'll get a second chance at awakening in the next life then we know we can get away with cutting corners this time around. This may be why some texts describe the chances of getting another human life as similar to those of a turtle swimming in the great ocean popping his head up once a year to breath and managing to put his head through a ring that is floating around on the ocean at random. If our chance of a second chance is infinitesimally small, that might also motivate us. On the other hand if out chance of liberation is infinitesimally small then we may decide it's not worth it. So beliefs are not totally unimportant because they affect our motivation to engage in the important task. So that is my version of what thinking like a Buddhist would look like. The argument about karma & rebirth looks a bit silly in this view. Even if we win the karma & rebirth argument, one way or the other, so what? We're still caught up in experience; still drunk on sense pleasures. We're still disappointed by experience: pleasures that stop and pains that won't. There is a certain amount of pleasure in winning an argument. But like all pleasurable experiences, it doesn't last. We either have to find a new argument to win, or dine out on nostalgia. After a while it all just gets boring. If we're not resigned to a boring life we might look for more frequent or more intense stimulation. Become an internet troll, take up extreme sports, or whatever. But no one ever reaches contentment by going down that road. Thinking like a Buddhist puts metaphysical speculation firmly off to one side. Thinking like a Buddhist, one simply does not get involved in such arguments. The wise don't get involved in disputes, as the scripture says. So the people we end up arguing with are not usually the wise. We think about problems not as Buddhists, but as philosophers of one kind or another. As though treating belief as a zero-sum game makes it meaningful. If in fact one does win the belief game and prove one's belief is "true" that is probably a long-run loss because it makes one less likely to examine the experience of holding a view. It means one is more intoxicated, rather than less. On 7 January 1610 Galileo began a series of observations of Jupiter through his new telescope. He lived in a world in which people in Europe believed the earth was at the centre of a perfectly spherical universe, created by God ca 4004 BC. In this idealised view all the moving bodies of the heavens were perfect spheres moving in perfect circles around the earth. This view was synthesis of Christian theology, Platonic philosophy and Ptolemaic astronomy. What we might call the "Hellenic legacy" since all three sets of ideas were originally written in Greek. On that night in 1610 Galileo saw four points of light in a line close to Jupiter. They were not visible to the naked eye, but relatively bright in the telescope. He continued to observe these new heavenly bodies and noted that they appeared to move against the back drop of stars similar to the way planets move. Then on 10 January one of them disappeared! And he correctly deduced that it must have disappeared behind Jupiter and that the four points of light were in orbit around Jupiter. He had discovered what we now call the Galilean moons of Jupiter. A short time later he turned his telescope on the moon. Now the moon was thought to be a perfect sphere with a perfectly smooth surface. How they accounted for the visible patterns I'm not sure. But Galileo was able to deduce from shadows cast by prominences associated with what we now know to be craters, that the surface was from far from smooth. The importance of these observations some 400 years ago cannot be overstated. They were cracks of imperfection appearing in the perfect world. If bodies were in orbit around Jupiter then the model of everything in orbit around the earth was refuted. If the moon was not a perfect sphere the whole universe might be imperfect. At the very least God's representatives on earth were wrong about the universe. The whole of Europe, and through it the world, was shaken by this simple act of observing. It's almost impossible for those of us who live now to understand the seismic shift that occurred. And of course Galileo was far from diplomatic in confronting Church leaders with these observations. He provoked an angry response and was not forgiven for almost four centuries in 1992 (long after the Church accepted the facts of his observation). Galileo was a man who pulled the wings off fairies to the horror of the Peter Pan's in the Vatican. There is something about this conflict and not only because it has played out time and again. Supernatural, superstitious, and fantastic ideas were undermined time and again by repeated observation and deduction. Galileo and a few of his contemporaries were the thin end of a wedge that cracked open the perfect world and then shattered it. Momentum grew into the Enlightenment during which time everything that could be observed was observed. (Our translation of bodhi as "Enlightenment" is a conscious attempt at alignment of Buddhism with the European Enlightenment by 19th century scholars). The Royal Society of London for Improving Natural Knowledge, usually known simply as "The Royal Society" was founded in 1660. In 1665 Robert Hooke published Micrographia: or, Some physiological descrip-tions of minute bodies made by magnifying glasses. 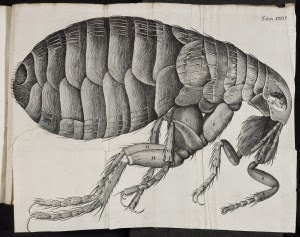 Hooke showed how how various creatures and things looked when viewed through one of the first microscopes. Worlds beyond the human scale began to open up in both directions. Newton published Philosophiæ Naturalis Principia Mathematica in 1687. We still make use of his mathematics today. But Newton's observations had a major implication that is often overlooked. Heavenly bodies had to obey the same physical laws as earth-bound bodies. Newton was the first to propose a universal physical law that had its basis in observation. In effect he unified heaven and earth. Although we think of Darwin as epoch making, he came some 200 years after Bacon, Hooke, Newton, Leibniz, and other great natural philosophers. By the time Darwin came along the djinn was well and truly out of the bottle. But Darwin's (and the almost always forgotten but equally creditable Alfred Russell Wallace's) work was in it's own way a seismological event. What they all did, in fact all they did, was to observe the world and pay attention to the way it actually worked rather than working from pure speculation. The balance of responsibility for understanding the world shifted decisively from abstract philosophy and theology towards natural philosophy (what we now call "science"). European abstract philosophy had imagined a perfectly ordered world. Of course this appealed to Christian theologians who worked this into their accounts of God's Creation. The dream of an ordered world is important everywhere - it's evident in Indian religions as well, including Buddhism. It is the one of the central themes of all the world's mythologies. A huge effort over tens of thousands of years has gone into creating stories about the order of the world. Things happen for reasons. Unfairness will be balanced out at some point. Death, the greatest unfairness, will be compensated for by an afterlife. Out of this impetus come the idealised stories of perfect worlds created by perfect gods. Of course to some extent these stories highlight regularities in the natural world: the path of the sun, moon, and stars; the seasons; generations and so on. Natural philosophy changed all this. The imperfections of the religious account of the universe was shown to be "not even false", but pure fantasy. The main strength of natural philosophy was that anyone could look for themselves and see it. No intermediaries, no priests are required. I've seen the Galilean moons of Jupiter through a small telescope, though not had the patience to watch them over a period of time. While on retreat in Spain in 2005, however I did watch the Planet Venus over about four months during which time it moved in relation to the background stars and even went retrograde (changing it's direction of motion). It's all there for anyone to see. In my science classes in secondary school and university I've reproduced most of the observations of those pioneering natural philosophers. I've seen what they saw. There were of course some who resisted that change. In fact according to a recent survey about 10% of Britons prefer Young Earth Creationism to evolution, while only 25% are confident Darwinian evolution is "definitely true" and another 25% think it's "probably true." Half of Briton's don't believe in evolution at all (Guardian). We live in a highly pluralistic society. Some people I know sincerely believe that when they die their "consciousness" will hang around their dead body for up to 49 days (as per the Tibetan Book of the Dead) and will be able to sense what is going on - i.e. to be aware of how people are reacting, what they are saying, and how their remains are being treated. Likewise they believe that living people are be able to "sense" the presence of the deceased and empathise with their emotional state. Then the deceased will be reborn as another being (mostly we presume human). On the other hand my Mother believes that God created the world; that Jesus died for our sins; that God loves everyone and that there is a plan for everything that happens (and she's witnessed some pretty horrendous stuff). When she dies her soul will ascend up to heaven, and now that she's a Catholic she presumably believes in a bodily resurrection at some point as well. Neither belief is something that anyone can base on observation. We might have experiences around corpses that we interpret as a presence, or we might have a sense of love amidst horror, but someone with a different belief system is free to interpret these subjective experiences in different ways. And not everyone has these kinds of experiences. When Galileo observed points of light moving he interpreted them as "moons". Why is this different? Because even those with different belief systems could make the same observation, and unless they insisted on some irrational interpretation they would be forced to conclude that Jupiter has satellites. The moons of Jupiter are independent of the observer. They are objective facts. The spirit of a dead person as a phenomenon is apparently dependent on the belief system of the observer, and thus not an objective fact. Over the years experience has shown that if the potential observer of a super-natural phenomenon is a scientist then the effect is much less likely to be observed. This alone is telling. When the belief system of the observer determines whether or not they are able to observe the phenomenon then that is an entirely different order to the Galilean moons. "A hallucination is a perception in the absence of apparent stimulus that has qualities of real perception. Hallucinations are vivid, substantial, and located in external objective space." But we note that Metzinger himself was eventually persuaded against this compelling dualistic explanation. Careful observation of the phenomena he experienced and comparing notes with other neuro-scientists showed that the experience was not in fact consistent with a truly disembodied consciousness. And the insights into the nature of our sense of self that follow from his exploration are more fascinating, to my mind, than any supernatural phenomenon. It's important to distinguish looking for a naturalistic, objective explanation of an experience and the dismissal of it as a fantasy. Such experiences can be utterly compelling and deeply meaningful for those who have them. It's not stupid to believe in God or karma or whatever. There are many factors in our make up that make it such beliefs plausible. Justin Barrett argues, in his book Why Would Anyone Believe in God?, that we believe because it is entirely natural to believe. Note that he does not argue that it is correct or sensible, only natural. But it is rational given the kinds of judgements our minds make. So just attacking belief or mocking it are unhelpful. If we publicly attack someone's belief system, if we start pulling wings of fairies, then we're being rude at best. Belief is not a simple matter. It's often the result of deep conviction. My understanding is that belief is very much tied into our system of values. When we attack someone's beliefs, we attack their values, or at least that is how they experience the attack. Aggression, I know from personal experience, diminishes the likelihood of communication. We may even choose to be rude to people on purpose to make them averse to us. Or may think that shock tactics will jolt someone out of their complacency. But on the whole I find this does not work. Shock most people and they respond with sharp aversion. Aggression is good for defending boundaries, but not for bridging them. On the other hand walking around any city in the world shows how people respond to being surrounded by strangers. We cannot be open to every possible encounter and it is often necessary to erect barriers to preserve one's sanity. Now this situation is complicated, especially in the USA, though keeping in mind that even in the home of Charles Darwin only about half the population accept Evolution on the evidence they're aware of. Fundamentalist Christians are vocally and vehemently protesting that their version of the what the world is like, based on a literal reading of an English translation of the Bible, ought to be at least on the same level as a description of the world that is independent of belief. They want everyone to learn about Creationism on the same level as Evolution. If someone has started an argument, especially one that would so drastically affect how we educate children, then it's only fair that everyone gets to have a say and that everyone argues to the best of their ability. Once it becomes a high stakes debate, pointing out the weaknesses and flaws in the argument of the opposition is part of the process. If religious people are quietly and harmlessly getting on with their lives, then we ought to leave them to it. If they want to control public life, then a debate is necessary. On the whole the moments that have changed my worldview, changed my life, have been encountering new information that contradicted my beliefs in a relatively neutral setting, often reading a book in or from a library, experiencing the resultant cognitive dissonance, and deciding to learn more about the subject on my own. It takes time and leisure to weight things up and consider the implications. A shift in worldview is non-trivial. I can't make someone reconsider their views just by bombarding them with facts. Why are their so many climate change deniers? Partly because the facts have been presented in a confused and confusing way. The media, thriving on conflict, has given far too much air time to a small group of contrarians. The climate change message also partly fails because climate change activists have just bombarded people with a mass of facts disconnected from any attempt to connect with people on an emotional level. They try to drill facts into us, try to scare us. Climate change are expressing their own values and all too often appear to express contempt for any other values. And that is never effective. If I stand on a street corner shouting out what I believe to be facts that have terrible implications (my views on politicians for example), then I will never convince anyone of anything, particularly not here in the UK! One does see street preachers doing this. It converts no one. But the going through the ordeal, being willing to experience the humiliation of being ignored at best or being abused by the public, is a signal to others that one's faith has high value. Research has shown that such sacrifices strengthen the faith of the faithful (see Martyrs Maketh the Religion). One could say exactly the same for Richard Dawkins' approach to arguing with religious people. It's an exercise is appealing to militant atheists, not a genuine attempt at dialogue or conversion. And of course militant atheists lap it up. Buddhist texts are often like this also - full of appeals to the faith of the faithful. I've discussed this in an essay called Martyrs Maketh the Religion (2010). There is a clear and important distinction between knowledge and belief. More and more of us are placing our reliance on knowledge as opposed to belief largely because one is a demonstrably better guide to life than the other. But the issue is complicated. What counts as valid knowledge is and always has been disputed. Knowledge is a negotiated communal domain. 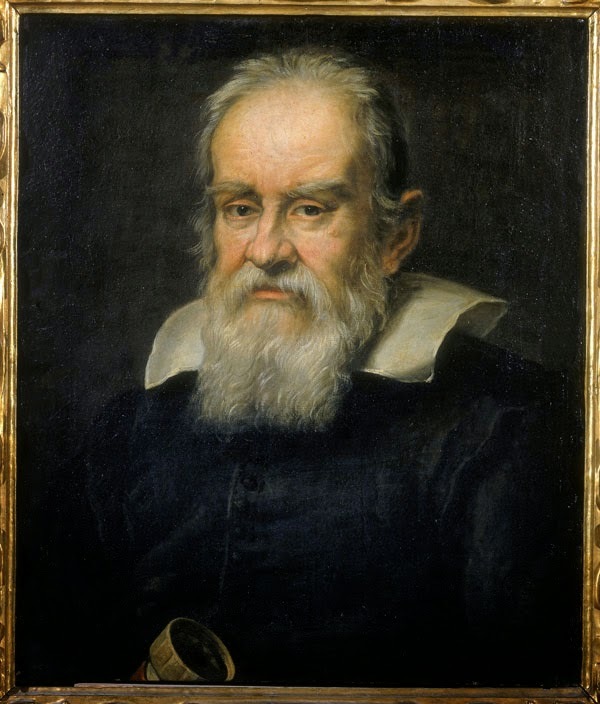 What Galileo and his successors did was establish ways of validating knowledge that went beyond the usual means of discussion about what seemed likely with the best arguer becoming the authority. They collectively established the possibility of independent, objective facts and the value of them. Philosophers still tend to see everything from an individualist point of view - knowledge in this view is inevitably subjective. But in fact we, humans, are communities. And for this reason we can establish objective truths: Jupiter has four large moons (and many smaller ones) and they are in elliptical orbits around Jupiter. There is no rational or reasonable objection to this. It's not my opinion or Galileo's, it is the observation of everyone who has taken the time to look. And it does not depend on a belief in Newtonian mechanics (the discovery predates Newton!). It is 400 years since Galileo discovered that philosophers and priests had simply made up their accounts of the world and were wrong about it. In that 400 years more and more of the unseen world has become seeable. And in every case so far where a proposition can be tested, the abstract philosophers and priests have been shown to be wrong. However, being in possession of knowledge is not sufficient. How we communicate knowledge is at least, if not more, important. Truth presented badly fails to be accepted (evolution and climate change being two important examples). Pulling wings off fairies is counter productive. Falsehood presented well may well become the accepted "wisdom". I've repeatedly argued that we judge the salience of facts by how we feel about them. Thus people may be understandably reluctant to believe the awful truth. We must try to find a way to connect with people before trying to change their minds. Sometimes, as a last resort, confrontation may be necessary. But people aren't persuaded by ridicule. On the contrary being willing to accept loss rather than inflicting it (i.e. martyrdom), is more likely to persuade people. On the other hand we can also understand some of the frustration of natural philosophers. Having spent the last 400 years showing that priests are wrong about every testable proposition, we might wonder why anyone still listens to priests at all. Despite the fact that the unseen domain has consistently shrunk, it remains and while it remains priests (and those who pretend to the knowledge traditionally associated with priests) can claim to be experts on it. And of course there are enduring imaginative stories about what might exist in an unseen domain so that it seems to be a larger domain than it actually is. If we believe in an afterlife for example, the then the unseen domain seems infinitely larger than the seen. 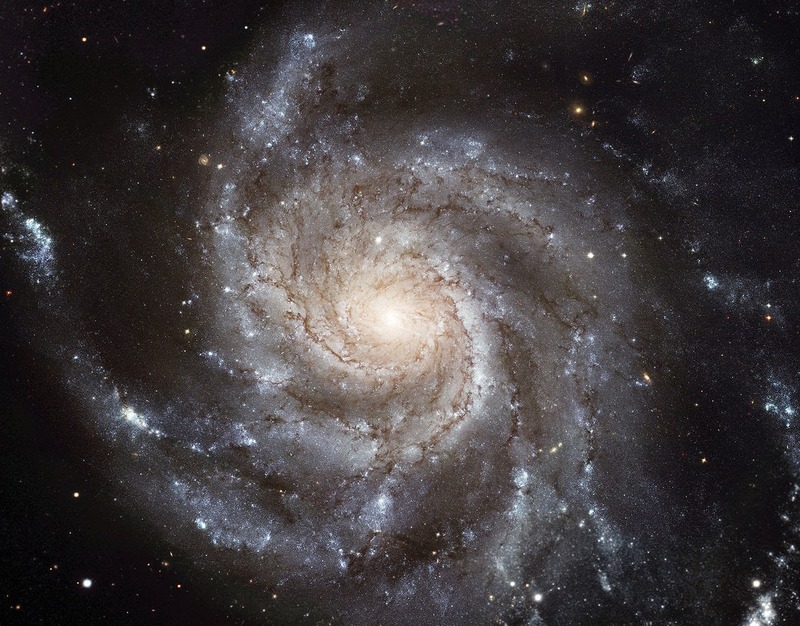 Some people remain far from convinced that an accurate view of the universe is even desirable. Magical thinking, faith in God and all kinds of supernatural views still seem more attractive to many people. It has been four centuries since Galileo's observations, but this is a legacy stretching back at least 65,000 years so it might take a while yet before we sort it out. In a recent exchange in comments on Dhīvan's blog, Two Meanings of Karma, he drew my attention to the Sīvaka Sutta. This sutta says that kamma is only one of eight causes of experience and introduces the term pubbe-kata-hetu "caused by former actions", which is discussed below. Related suttas help to flesh out what is meant by the term and place important limits on the doctrine of karma. The early Buddhists were critical of the view that everything we experience is a result of past actions because it is a form of determinism that eliminates meaningful moral choices. As such this teaching touches on the subject so dear to Western moral philosophers, i.e. free will. I begin with my translation of the Sīvaka Sutta and a discussion of the main terms and ideas and then contrast it with the Titthāyatanādi Sutta (AN 3.61) with passing reference to the Devadaha Sutta (MN 101). Mr Gotama, what would you say to the toilers and priests whose ideology is "whatever a person experiences (paṭisamvedeti), whether pleasant, unpleasant, or neither, is all caused by past actions (pubbekatahetu)"? [The Bhagavan replied], Sīvaka, some experiences arise from the rising of bile (pitta); [this fact] one can personally know and [it] is considered true by [people in] the world. In this case, Sīvaka, those toilers and priests who claim that "whatever a person experiences is all caused by past actions" are wrong (micchā). They overshoot what is personally known and what is considered true by [people in] the world. Sīvaka, some experiences are also produced by the ripening of actions (kammavipāka); [this fact] one can personally know and [it] is considered true by [people in] the world. In this case, Sīvaka, those toilers and priests who claim that "whatever a person experiences is all caused by past actions" are wrong (micchā). They overshoot what is personally known and what is considered true by [people in] the world. That said, Moḷiya Sāika said this to the Bhagavan: "Awesome, Mr Gotama, that's awesome. Please remember me as an upāsaka who has gone for refuge for life. And ripening of actions as eighth. "Thus I heard, at one the Buddha was staying in Rajgir". Secondly the name Moḷiya-Sīvaka is quite interesting. In How Buddhism Began (p.135-164; esp. 151-4) Richard Gombrich proposed that we take Aṅgulimala to be a Śaiva doing extreme antinomian practices. Now the name Sīvaka is probably from siva 'auspicious, fortunate' with the suffix -ka (causing the lengthening of the initial vowel) and thus on face value means 'one who is auspicious'. In which case the name would be synonymous with svāstika. The Pāli is equivalent to Sanskrit śiva, which is also the name of a god: Śiva. Pāli sīvaka might well be Sanskrit śaivaka, "one who belongs to Śiva". Thus we might read Moḷiya-Sīvaka as 'a top-knotted Śiva devotee'. The Dictionary of Pāli Names has nothing to settle it either way, though the name is not common: in addition to our Sīvaka we find just one yakkha (DN iii.205; SN i.211); one physician who was Ānanda in a previous life (J iv.412); and two theras (Thag vs.14 & vss.183-4), one of whom lives in Rajgir. "Experiences" (present participle, not nominal plural) translates paṭisaṃvedeti. Here what one experiences is obviously vedanā and is characterised (as vedanā always is) as sukha, dukkha, or adukkhamasukha. Both paṭisaṃvedeti and vedanā come from the root √vid 'to know'. From this root we also get veda 'the knowledge'; vedanā 'the known', i.e. what becomes known to us, what we actually experience. Also in this passage: vedayita 'felt, experienced'; in the plural 'experiences'; such events are veditabba is 'to be known; knowable'. This cluster of terms is part of what makes "feelings" an unsatisfactory translation of vedanā. What we are talking about is that which we become aware of due to the activity of all our senses, including the mind. "Feelings" is far too narrow. Pubbekatahetu is a three-part compound: hetu = cause, kata = past participle of √kṛ 'to do, to make' and pubbe 'before, formerly'. The compound is a bahuvrīhi meaning 'whose cause is what was done before'. There is a related term pubbekatakāraṇa which we find in a commentarial passage on AN 3.61 where it is also glossed as "Experiencing with actions formerly performed as the only condition" (pubbekatakammapaccayeneva paṭisaṃvedeti). Visama-parihāra is an odd word. Bodhi translates 'careless behaviour', Thanissaro "adverse behavior", though PED suggests 'being attacked by adversities'. Parihāra is from pari√hṛ 'to attend, shelter, protect; carry about; move around; conceal; set out, take up, propose'. PED takes it to mean 'surrounding' in the figurative sense. Visama is literally 'uneven, unequal, unharmonious'. Figuratively in a moral sense, 'lawless, wrong'; and 'odd, peculiar.' Buddhaghosa glosses: "Produced by adverse circumstances" means carrying a heavy load, pounding cement etc, or snakes, mosquitoes or falling in a pit, etc for one wandering at the wrong time. "Visamaparihārajānīti mahābhāravahanasudhākoṭṭanādito vā avelāya carantassa sappaḍaṃsakūpapātādito vā visamaparihārato jātāni." (SA iii.81) Thanks to Dhīvan for helping me with this passage. I think his translation of visama-parihāra as 'adverse circumstances' is better than either Bodhi or Thanissaro and I have adopted it. The main point is that the view that everything we experience is a result of past karma is in fact wrong (micchā). I've pointed this out before and drawn attention to the Devadaha Sutta (MN 101) as another text which refutes this view. There it is attributed to Nigaṇṭhas who we usually take to be the Jains. The idea of pubbekatahetu is also criticised in the Titthāyatanādi Sutta AN 3.61 (i.173) where it is one of three sectarian heresies (tīṇimāni titthāyatanāni). Faced with such a claim as "everything that one experiences is due to past actions" the Buddha questions his opponent about the reasons for unethical behaviour (the dasa kusala-kammapatha; known in the Triratna Order as that "the ten precepts"). In some sense this is a question of free will. The idea that everything we experience is due to past action is a form of determinism. The Buddha's critique points out that if we accept a form of determinism then we have no motivation in regard to moral moral choices in the present, and thus the possibility of liberation is lost. Pubbekataṃ kho pana, bhikkhave, sārato paccāgacchataṃ na hoti chando vā vāyāmo vā idaṃ vā karaṇīyaṃ idaṃ vā akaraṇīyanti. Iti karaṇīyākaraṇīye kho pana saccato thetato anupalabbhiyamāne muṭṭhassatīnaṃ anārakkhānaṃ viharataṃ na hoti paccattaṃ sahadhammiko samaṇavādo. However, bhikkus, for those falling back on former action (pubbekata) as the essence it is not a motivation for, not an effort towards, distinguishing between right and wrong. As a result of right and wrong not being truly and reliably ascertained, there is dwelling forgetfully and vulnerably. [Former action] is not, on its own, the doctrine of the samaṇa who is Buddhist. Of the three other translations I consulted (Bodhi, Thanissaro, and Piya Tan) I disagree with all of them as to how to render the last sentence. All translate samaṇavādo in the sense of 'call oneself a samaṇa'. Samaṇa-vāda is a nominal compound in the nominative. PED sv. vāda has "2. what is said, reputation, attribute, characteristic." PED cites Sn 859 for this reading, and one Jātaka reference. The final pāda of Sn 859 reads tasmā vādesu nejati. The Niddesa glosses vādesu here as ‘criticisms, blame, reproaches, not getting any renown, not being praised’. Though the SnA has "On that account he is not cowed because of criticisms" (taṃ kāraṇā nindāvacanesu na kampati) and K R Norman seems to follow this interpretation in his translation : "therefore he is not agitated in [the midst of] their accusations". (p 107 & 338-9). But the this also fits with the context. It seems to me that PED is probably correct to include this second sense of vāda in SnA, since that is how the commentator understood it, but wrong to attribute it to Sn. It's a commentarial usage not a sutta usage. As far as I can see there is no parallel usage in Sanskrit. I had some discussion with Dhīvan on this and he pointed out: "Looking at the comm., it’s clear that the translators are following what it says but putting it into clearer English. So Buddhaghosa’s argument is that the ascetics who claim that what is experienced is caused by past action are not really ascetics because non-ascetics also believe this, it’s not a right view that will get you anywhere, so it’s hardly a good view for a so-called ascetic. Thus we can see where the other translations are coming from. My feeling, however, is that we should always make a strenuous effort to translate the text and at the very least include it as a footnote, before adopting the commentarial gloss. Buddhaghosa's view is not that of early Buddhism, but that of 5th century Theravāda scholasticism. Sometimes it's helpful and sometimes not. Here I disagree with him. His reading is one that requires us to treat rather too many words as meaning something other than their obvious meaning. Na hoti samaṇavādo would be an entirely straight forward sentence meaning, 'It is not the doctrine of a samaṇa' [with an emphasis by putting the verb first]. Sahadhammiko is in the same case as, and thus goes with, samaṇavādo. Piya Tan says it is an adverb 'with justice' and Bodhi also translates as an adverb, 'legitimately'. This appears to be based on the commentarial gloss: sakāraṇa (above). However as an adverb it ought to be in the accusative, not the nominative. By contrast paccattaṃ is a neuter accusative used adverbially (individually). So, sahadhammiko simply cannot be an adverb, it can only be in apposition with samaṇavādo. The commentarial gloss is mistaken and misleads those who follow it. Here I take sahadhammiko in the obvious (and dictionary) meaning of 'one who shares a dhamma' or a 'co-religionist', i.e. from our point of view, another Buddhist. And the idea that everything we experience is due to past action is a not the doctrine of a samaṇa who is Buddhist. Indeed, as above, it is the doctrine of a samaṇa who is a follower of Nigaṇṭha Nāgaputta, which is to say, a Jain. So sahadhammiko samaṇavādo must mean 'the samaṇa doctrine which is co-religionist' (as I understand it sahadhammiko specifically qualifies vādo). In more elegant English, "the doctrine of the samaṇa who is Buddhist." One of the problems here is the switch from plural to singular. Bodhi, for example, translates as though the whole as plural. But I think in "na hoti paccattaṃ sahadhammiko samaṇavādo" we have a completely separate sentence in the singular with an implied 'it' as agent. And the obvious candidate for 'it' is pubbekata 'former action'. Thus the sentence means "[Former action] is not, on its own, the doctrine of the samaṇa who is Buddhist." "Now, this way, everything is karma. Only one thing that is not karma that is the Buddha nature and the enlightenment." Strictly speaking, therefore, from a Buddhist point of view, you cannot say that there is anything in our ordinary experience that is not somehow a result of our karma. These same teachers argue that their view is not deterministic and that a particular calamity cannot be viewed as a punishment for some particular act. However, the Dalai Lama, for example (and I have heard Robina Courtin of the FPMT say the same), believes that the Chinese invasion of Tibet was because the present occupants of Tibet had accumulated bad karma in past lives (See this personal account of a discussion the DL for example). I happen to think that the early Buddhist view is more coherent and less a result of blind faith in a supernatural force, but the really interesting thing is that once again we see that the metaphysics of a basic Buddhist doctrine changed. I say once again because I have already written about another way that karma changes from being inevitable, if mitigable, to being entirely avoidable through the use of mantras. Over the centuries the doctrine of karma has been modified to suit the needs of Buddhists. Perhaps the two changes are related. After all a hardening of views towards everything being a result of karma would probably make the ability to avoid the consequences of karma seem more attractive. Perhaps the change to everything being the result of karma required a let out so that it was not absolutely deterministic? The commentarial teaching of the "fivefold restriction" (pañcavidha niyama) is sometimes cited as another example of how karma is not the only type of causation in our lives. This is mainly due to a modernist interpretation promulgated by Ledi Sayadaw and Mrs Rhys Davids in the 1930s, and Sangharakshita's development of their ideas in the 1960s and 2010s. (For the history of the idea see Dhīvan's essays and published article). In Pāli, we don't have "five niyamas" but one fivefold niyama which is five applications of one principle of conditionality. The doctrine seems to aim at naturalising Buddhists ideas about three subjective or supernatural processes: cognition (citta); the functioning of karma; and the miracles associated with a buddha (dhamma-niyama). This done by likening them to observable processes in nature. So we have bījaniyama which describes rice seeds becoming rice plants and producing rice grains; and utuniyama, the fact that trees flower and fruit together in the appropriate season. These are limitations or restrictions (niyama) on how natural events unfold that can be observed by everyone in nature and they form the model of understanding unseen processes. To some extent the Buddhist model of cognition is a result of introspection by yogis, but we can only ever observe our own cognitive process and never someone else's (at least this limitation clearly applies in Iron Age India). However Buddhists felt confident in providing a generalised description of cognition all the same. Similarly the process of karma is unseen and supernatural - it operates behind the scenes and cannot be understood in it's specifics. Karma, the idea that good and evil deeds have appropriate consequences for the appropriate person, is an article of faith. The various miracles accompanying the life history of a Buddha are also supernatural and by the time the niyama doctrine is composed they occurred centuries in the past. The argument is that the limitations on the natural, seen processes of seeds and seasons, apply also to the unseen and supernatural. Clearly the analogy of karma with the process of planting seeds and reaping grain was one that appealed to the Indian mind, because a more literal version of this same analogy became the main Mahāyāna view of karma. The seeds were even provided with a storage pit in the from of the alayavijñāna. The point about karma here is not that it is only one of many types of conditionality, but another example of the one type. It is a "natural" process characterised by inevitability, by results which are appropriate to the cause, and by ripening in due season.The idea that not everything is a result of karma is fine. As above it is definitely part of the early Buddhist view on karma. It's just that this is not the point of the niyama. So the basic Buddhist teaching is that experiences are not all dictated by karma. 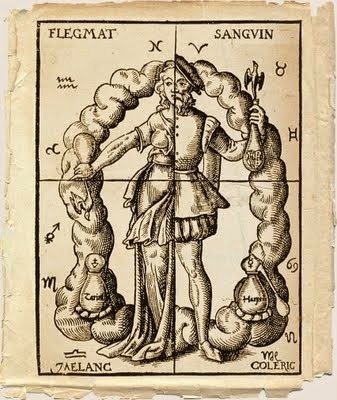 A variety of causes and conditions including health, seasonal changes, and just plain luck can be invoked. The view that everything we experience being the result of karma is specifically criticised as deterministic. Such a view leaves us unable to make moral choices which is why early Buddhism rejects it. Buddhist soteriology requires that we have a measure of freedom to choose between right and wrong. However, according to this basic teaching, karma does determine which realm we will be born in. And one of the characteristics of the manussaloka or human realm, is that humans have sense objects, sense organs, and the potential for sense consciousness. Thus as human beings we experience vedanā every moment of our waking lives. And how we respond to vedanā is karma. Norman, K R. (2006) The Group of Discourses (Sutta-Nipāta). PTS.